The muscle spindle fibers are the primary sensory mechanism for triggering a powerful concentric contraction in a plyometric movement. Using the correct exercises at the appropriate time in a training program is key to ensuring enough stimulation for a positive adaptation but without creating excessive stress that can lead to injury. Plyometric Anatomy presents advanced drills and a variety of progressions that will help you maximize strength, power, speed, and agility. Highly detailed anatomical art illustrates muscle activation and interaction for each drill. Elite players, coaches, and trainers rely on plyometrics to develop power, agility, speed, strength, body control, balance, and overall athletic performance. In this authoritative guide to plyometrics, you’ll learn the most effective drills and exercises, and you’ll see the results. 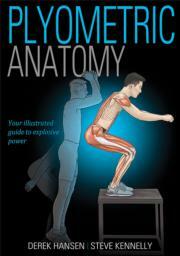 In Plyometric Anatomy, authors Derek Hansen and Steve Kennelly share the training they have used to propel athletes at all levels to success. Together they detail 94 plyometric exercises, along with 78 variations that increase in difficulty for continued development over time. With content on bilateral exercises, unilateral exercises, core exercises, and plyometric combinations, it’s all here. Best of all, you will go beyond the instruction and see the muscles in action. Each exercise is fully illustrated with detailed anatomical art to showcase how muscles interact with surrounding joints and skeletal structures. You will learn how variations, progressions, and sequencing can affect development, recovery, and ultimately performance. With comprehensive coverage and expert insights, Plyometric Anatomy takes the guesswork out of training and provides the best tool to help you achieve dynamic strength and explosive power. It is the ultimate illustrative resource for maximizing athletic power production. Derek Hansen, MASc, CSCS, has worked with athletes in speed, strength, and power sports since 1988. Originally a coach for track and field athletes, Hansen expanded his services to assist athletes in all sports, with an emphasis on speed development. As a coach and a consultant, he has worked with some of the top performers in the world, including Olympic medalists, world record holders, Canadian National team athletes, professional sports organizations and professional athletes from numerous sports. He has developed some of the top sprinters in British Columbia, and he continues to work with some of the fastest athletes in various sports.